A new compact digital pump for low flow transfer and dispensing offers the ease of use operators are looking for. The new Masterflex L/S Digital Miniflex Pump Systems from Cole-Parmer are complete systems which include a pump head and drive. The precision digital drive offers a maintenance-free high accuracy motor and an icon-driven interface that makes setup and operation easy and intuitive. 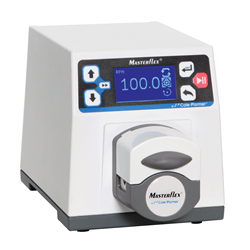 The high-contrast graphical LCD shows operating parameters: flow rate, drive speed, continuous run, and copy dispense, allowing you to view pump performance continually. The brushless motor offers ±0.1% speed control accuracy with a 3000 to 1 turndown ratio for a wider flow range. Dispensing features include a copy/repeat setting with programmable batch count and a programmable dispense interval that allows hands-free dispensing and filling. An integrated open-head sensor shuts down the drive if the pump head is opened while running. Remote control capabilities allow easy integration into automated processes. Created for transferring, feed, sampling, or filling applications in laboratories and research settings, the new pump systems deliver repeatable low flow rates with flow ranges of 0.004 to 315 mL/min (depending on the model and tubing size selected). Pumps operate with continuous tubing to save costs by eliminating leakage and the need for fittings or connections, thus providing a cleaner fluid path. Single- and dual-channel models are available. To view the Masterflex L/S Digital Miniflex Pump Systems, go to ColeParmer.com/21539 or call 800-323-4340 for more information.